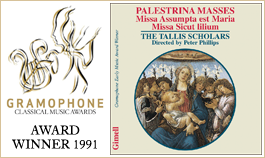 Among Palestrina’s twenty-two six-part settings of the Mass, the Missa Assumpta est Maria and the Missa Papae Marcelli (recorded on CDGIM 339) have long been the most celebrated. In both cases the power of the writing is largely attributable to bright sonorities: both have two tenor parts and Assumpta est Maria also has two soprano parts. No Renaissance composer and few later ones have been as proficient as Palestrina at writing positive, outward-going, major-key music, and in this context Assumpta est Maria represents one of the most important works of the period. By contrast, Sicut lilium presents a quite different side of his thought: subdued, contemplative, sometimes sensuous as the words of the motet require. Although Palestrina is much less well known in this mood, he wrote a large number of pieces which are akin to Sicut lilium, of which the Missa Nigra sum is perhaps the most accessible, though many of his madrigals provide excellent examples of the same thing. It was our deliberate intention to pair two works in such contrasting styles from this great master. It is interesting to follow the historical process by which a work like the Missa Assumpta est Maria becomes so much more famous than any other comparable work of the period. It is not essentially that it is a better piece of music than all the other contenders. The Missa Assumpta est Maria is not better than Palestrina’s fine six-part Mass Benedicta es caelorum, but it is better known because at some early stage it caught the eye of an editor who, by publishing an inexpensive edition of it, established a demand which the quality of the music was able to sustain. The Missa Sicut lilium, as it happens, has never been published outside the two complete editions of Palestrina’s output and so, like the bulk of this composer’s music, it is available in print but probably has never been performed. The whole system of reputation in pre-Baroque music rests largely on historical accident and is open to review at any time. It also seems to help a piece if there is an attractive story to go with it, and the Missa Papae Marcelli has undoubtedly benefited from this. There have been fourteen different editions of Papae Marcelli since the middle of the nineteenth century and eight of Assumpta est Maria (of which the first was prepared by Carl Proske in 1835). Palestrina’s earliest success in modern times was the eight-part Stabat mater which first appeared in Paris in 1810 and has so far received thirteen editions, including one by Richard Wagner. On the other hand, The Tallis Scholars had to rely on their own editions for recording the Masses Sicut lilium, Nigra sum, Benedicta es and Nasce la gioja mia. 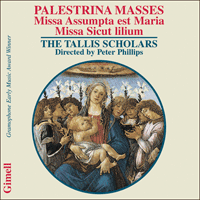 In general, public preference has been for Palestrina’s later works, of which the Missa Assumpta est Maria is one. The greater precision of thought which characterized Palestrina’s writing after the Council of Trent has found favour throughout the Christian world. Indeed such pieces as the Missa Assumpta est Maria have regularly been performed in recent years in Protestant services where the kind of syllabic setting shown, for example, at the beginning of the Gloria is in line with one of the founding principles of all the reformed religions. The more relaxed, more abstract style of such early settings as the Missa Sicut lilium has not often been heard in church services since the first half of the sixteenth century, but it has increasingly attracted a following among concert-goers who pay to hear the music as music, rather than as an adjunct to worship. It is a feature of modern music-making that professional concert-choirs do not necessarily choose the same repertoire as that of church choirs, even though they make their selection from the same composers. Neither the motet nor the Mass Assumpta est Maria was published in Palestrina’s lifetime, which supports the idea that they were late works, since all those settings most likely to sell had appeared in print before the composer’s old age. The musical style of them both supports this too: there is noticeably little thorough imitation between all six parts, but there is a great deal of block-chord writing. In the motet the semi-independence of the part-writing is apparent from the beginning, and by the words ‘benedicunt Dominum’ all counterpoint is briefly suspended. These features inevitably transfer themselves to the parody Mass, most obviously in the Gloria and Credo, but also in the shorter movements where greater elaboration was customary. The first Kyrie, for example, begins with imitation between all the parts but very quickly has settled into alternating harmonically controlled phrases which rely for their effect on being rescored. It is the inventiveness of these different sub-divisions of the main choir, constantly grouping and regrouping, and the elastic way in which the text is set, which gives this music its irrepressible character. By contrast the motet Sicut lilium was published in Palestrina’s First Book of Motets in 1569. The Mass based on it did not appear until the Fifth Book of 1590—which was about half-way through his Mass publications—but there is every reason to think it a quite early work. The musical style is noticeably lucid, and although it is not as protracted as some of his very first settings, like Benedicta es caelorum, in which he was still clearly learning his trade, there is some exhaustive working of the basic musical material. In the motet the opening point is treated to two complete expositions in leisurely style, and the remaining music is scarcely less elaborately laid out. Similarly in the first Kyrie of the Mass Palestrina states the point twice, while cleverly abbreviating the entries, and all the other movements except the Gloria start with imitation of some kind, even the Credo. The Gloria is the most forward-looking movement in stylistic terms with a succession of homophonic statements at ‘Laudamus te. Benedicimus te’, though their musical derivation from the motet is unmistakably preserved. This Fifth Book of Palestrina’s Masses was dedicated to Duke William V of Bavaria, whose cantor was Orlandus Lassus. Presumably Lassus took part in performances of the pieces contained in it, though his sacred compositions scarcely reflect the elegiac mood of Sicut lilium and in general he seems to have learnt little of importance from Palestrina. Palestrina’s motet Sicut lilium is not the same setting as that which appeared as part of his cycle of twenty-nine motets on texts from the Song of Songs in 1583/4. Parmi les vingt-deux messes à six voix de Palestrina, la Missa Assumpta est Maria et la Missa Papae Marcelli sont depuis longtemps les plus célèbres. Dans les deux cas, ce sont essentiellement des sonorités brillantes qui donnent à l’écriture toute sa force: il y a deux voix de ténor dans les deux messes et Assumpta est Maria comporte également deux voix de soprano. Aucun compositeur de la Renaissance—et peu d’autres par la suite—n’a écrit aussi bien que Palestrina une musique positive en mode majeur, sans restreinte, et, dans ce contexte, Assumpta est Maria compte parmi les œuvres les plus importantes de cette période. Par opposition, Sicut lilium révèle un aspect bien différent de la pensée palestrinienne, contemplatif, retenu, parfois empreint de la sensualité que réclament les paroles du motet. Bien que Palestrina soit beaucoup moins connu sous cet angle, il n’en écrivit pas moins un grand nombre de pièces dans le même esprit que Sicut lilium. Parmi celles-ci, la Missa Nigra sum est peut-être la plus accessible, bien que nombre de ses madrigaux offrent d’excellents exemples de la même chose. Nous avons donc voulu associer deux œuvres de ce grand maître qui présentent des styles aussi différents. Il est intéressant de suivre l’évolution historique qui a rendu une œuvre comme la Missa Assumpta est Maria beaucoup plus célèbre que toute autre pièce du même genre à cette époque. Cela ne veut pas dire que cette œuvre soit supérieure à toutes les autres. La Missa Assumpta est Maria n’est pas supérieure à la belle messe à six voix de Palestrina, Benedicta es caelorum, mais elle est plus connue parce qu’elle a attiré très tôt l’attention d’un éditeur qui en a publié une édition peu coûteuse et, par là même, a créé une demande que la qualité de la musique a pu satisfaire. En fait, la Missa Sicut lilium n’a jamais été publiée, sauf dans les deux éditions complètes de l’œuvre du compositeur—tout comme la majeure partie des pièces palestriniennes, elle a donc été imprimée, mais probablement jamais exécutée. Tout ce qui fait la réputation d’une œuvre dans la musique prébaroque dépend le plus souvent d’un accident de l’histoire et laisse le champ libre à toute révision. Une histoire intéressante associée à une œuvre semble également bénéfique, et cela a sans doute été le cas de la Missa Papae Marcelli. Depuis le milieu du XIXe siècle il y a eu quatorze éditions différentes de Papae Marcelli et huit de Assumpta est Maria (la première fut préparée par Carl Proske en 1835). À l’époque moderne, Palestrina connut son premier succès avec le Stabat mater à huit voix que l’on vit apparaître à Paris en 1810 et qui, jusqu’à présent, a fait l’objet de treize éditions, dont l’une de Richard Wagner. Les Tallis Scholars, quant à eux, ont dû s’appuyer sur leurs propres éditions pour enregistrer les Messes Sicut lilium, Nigra sum, Benedicta es et Nasce la gioja mia. En général, la préférence du public est allée aux œuvres tardives de Palestrina, dont fait partie la Missa Assumpta est Maria. La plus grande précision de pensée qui caractérisa l’écriture de Palestrina après le Concile de Trente a été appréciée dans tout le monde chrétien. En effet, des œuvres telles que la Missa Assumpta est Maria ont été régulièrement exécutées ces dernières années lors de services religieux protestants où le type de mise en forme syllabique qui apparaît, par exemple, au début du Gloria va dans le sens de l’un des principes fondateurs de toutes les religions réformées. Depuis la première moitié du XVIe siècle, on n’a pas souvent l’occasion d’entendre lors de services religieux le style plus détendu, plus abstrait de pièces antérieures comme la Missa Sicut lilium, mais ce style rencontre des adeptes de plus en plus nombreux parmi les habitués des concerts qui paient pour entendre la musique en tant que musique et non comme accessoire du culte. Et dans la pratique musicale moderne, les chœurs professionnels qui se produisent en concert ne choisissent pas forcément le même répertoire que les chœurs d’église, même si leur sélection s’opère à partir des mêmes compositeurs. Ni le motet ni la Messe Assumpta est Maria ne furent publiés du vivant de Palestrina, ce qui semble bien indiquer qu’il s’agit d’œuvres tardives, puisque toutes les pièces les plus susceptibles de se vendre furent imprimées alors que le compositeur était encore relativement jeune. Le style musical des deux pièces va dans le même sens: on trouve peu d’imitation rigide entre les six voix, mais il y a surtout une écriture en accords groupés. Dans le motet, la semi-indépendance de la conduite des voix apparaît dès le début, et aux mots «benedicunt Dominum» tout contrepoint est brièvement suspendu. Ces caractéristiques se retrouvent inévitablement dans la messe-parodie, et plus particulièrement dans le Gloria et le Credo, mais aussi dans les mouvements plus courts où l’on trouve d’ordinaire une plus grande élaboration. Le premier Kyrie, par exemple, commence par une imitation entre toutes les voix mais s’installe rapidement dans des phrases alternées harmoniquement maîtrisées dont l’effet repose sur le fait qu’elles soient réécrites. C’est l’inventivité de ces différentes subdivisions du chœur principal, qui se reforme constamment, et la manière souple dont le texte est mis en place qui donnent à cette musique son caractère irrésistible. En revanche, le motet Sicut lilium fut publié en 1569 dans le Premier recueil de motets de Palestrina. La messe fondée sur ce motet n’apparut pas avant le Cinquième recueil de 1590—la moitié environ des messes palestriniennes venaient alors d’être publiées—mais il y a toutes les raisons de croire qu’il s’agit d’une œuvre assez ancienne. On peut noter un style musical clair et, bien qu’il ne soit pas aussi prolongé que dans certaines de ses toutes premières pièces (comme la Missa Benedicta es caelorum, où il était encore à l’apprentissage de son métier), il y a un travail approfondi sur le matériau musical de base. Dans le motet, la séquence d’ouverture fait l’objet de deux expositions complètes dans un style mesuré, et le reste de la musique est conçu de manière presque aussi élaborée. À l’identique, dans le premier Kyrie de la Messe, Palestrina expose la séquence deux fois tout en abrégeant habilement les entrées, et tous les autres mouvements sauf le Gloria débutent par une imitation quelconque, même le Credo. Le Gloria est le mouvement qui va le plus loin en termes stylistiques avec une succession d’énonciations homophones sur «Laudamus te. Benedicimus te», bien que leur filiation musicale avec le motet reste parfaitement claire. Ce Cinquième recueil des messes de Palestrina fut dédié au duc Guillaume V de Bavière, dont le chantre était Orlandus Lassus. Lassus participa probablement à l’exécution des pièces contenues dans ce recueil, bien que sa musique sacrée ne reflète guère l’atmosphère élégiaque de Sicut lilium et qu’en règle générale, il semble avoir retenu peu de choses essentielles de Palestrina. Le motet Sicut lilium de Palestrina n’est pas la même pièce que celle qui figure dans son cycle de vingt-neuf motets sur des textes extraits du Cantique des cantiques (1583/4). Unter Palestrinas 22 sechsstimmigen Vertonungen der Messe werden die Missa Assumpta est Maria und die Missa Papae Marcelli seit langem besonders geschätzt. In beiden Fällen ist die Kraft der Komposition zu einem großen Teil zurückzuführen auf das helle Klangbild: beide enthalten zwei Tenorpartien und Assumpta est Maria verfügt außerdem über zwei Sopranpartien. Kein Komponist der Renaissance, und wenige spätere, haben so meisterlich positive, extrovertierte Musik in Dur geschrieben wie Palestrina; in diesem Kontext stellt Assumpta est Maria eines der bedeutendsten Werke der Zeit dar. Im Gegensatz dazu zeigt Sicut lilium eine ganz andere Seite seines Denkens—gedämpft, kontemplativ, manchmal sinnlich, wie es die Worte der Motette verlangen. Obwohl Palestrina in dieser Stimmung sehr viel weniger bekannt ist, schrieb er eine große Zahl von Werken, die Gemeinsamkeiten mit Sicut lilium aufweisen. Von diesen am eingängigsten ist wohl die Missa Nigra sum, doch viele seiner Madrigale sind ebenfalls gute Beispiele dafür. Wir haben bewußt zwei in so unterschiedlichen Stilen geschriebene Werke dieses großen Meisters nebeneinandergestellt. Es ist interessant, den historischen Prozeß zu verfolgen, der dazu führt, daß ein Werk wie die Missa Assumpta est Maria so viel berühmter wird als vergleichbare Kompositionen der Zeit. Das liegt nicht unbedingt daran, daß die Musik besser wäre als bei den anderen Werken. Die Missa Assumpta est Maria ist nicht besser als Palestrinas großartige sechsstimmige Messe Benedicta es caelorum, doch sie ist bekannter, weil sie sehr früh schon einem Herausgeber auffiel, der, indem er eine billige Ausgabe veröffentlichte, eine Nachfrage nach dem Werk erzeugte, die der Qualität der Musik entsprach. Die Missa Sicut lilium dagegen ist außer in den zwei Gesamtausgaben von Palestrinas Werk nie veröffentlicht worden und ist so zwar im Druck erhältlich, wie die meisten anderen Kompositionen auch, aber wohl noch nie aufgeführt worden. Der Ruhm von Kompositionen in vor-barocker Zeit beruht zu einem großen Teil auf historischen Zufällen und schwankt ständig. Es scheint einem Werk auch zugute zu kommen, wenn sich eine attraktive Geschichte darum rankt—die Missa Papae Marcelli hat davon sicher profitiert. Seit der Mitte des 19. Jahrhunderts erschienen von ihr 14 verschiedene Editionen und acht der Assumpta est Maria (von denen die erste von Carl Proske 1835 besorgt wurde). Palestrinas frühhester „Erfolg“ in moderner Zeit war das achtstimmige Stabat mater, das zuerst 1810 in Paris erschien und seitdem 13 Editionen erlebte, darunter auch eine von Richard Wagner. Auf der anderen Seite mußten The Tallis Scholars auf eigene Editionen zurückgreifen für die Aufnahme der Messen Sicut lilium, Nigra sum, Benedicta es und Nasce la gioja mia. Im allgemeinen bevorzugt man heute Palestrinas Spätwerk, zu dem auch die Missa Assumpta est Maria gehört. Die größere gedankliche Präzision, die Palestrinas Kompositionen nach dem Konzil von Trient kennzeichnet, hat in der gesamten christlichen Welt Anklang gefunden. Werke wie die Missa Assumpta est Maria kommen in den letzen Jahren regelmäßig in protestantischen Gottesdiensten zur Aufführung. Die Art der syllabischen Partiturierung, wie man sie zum Beispiel am Anfang des Gloria findet, korrespondiert mit einem der grundlegenden Prinzipien aller reformierten Religionen. Den gelasseneren, abstrakteren Stil früherer Werke wie der Missa Sicut lilium bekam man seit der ersten Hälfte des 16. Jahrhunderts in Gottesdiensten nicht oft zu hören, doch im Konzertsaal wird er immer beliebter, wo das Publikum Musik um ihrer selbst willen hören möchte, und nicht als Beigabe zum Gottesdienst. Es ist bezeichnend, daß heutzutage professionelle Konzertchöre nicht unbedingt dasselbe Repertoire wählen wie Kirchenchöre, obwohl sie ihre Auswahl unter denselben Komponisten treffen. Weder die Motette noch die Messe Assumpta est Maria wurden zu Lebzeiten des Komponisten veröffentlicht, was dafür spricht, daß es sich bei ihnen um Spätwerke handelt, da alle Partituren, die sich relativ leicht verkaufen ließen, im Druck erschienen waren, ehe Palestrina ein alter Mann war. Der musikalische Stil beider Werke unterstützt das: man findet auffallend wenig strenge Imitation zwischen den sechs Stimmen, dafür aber eine häufige Verwendung von Blockakkorden. In der Motette wird von Anfang an deutlich, daß die Stimmen teils unabhängig geführt werden, und bei den Worten „benedicunt Dominum“ wird kurzfristig auf allen Kontrapunkt verzichtet. Diese Merkmale übertragen sich zwangsläufig auf die Parodiemesse, am auffallendsten im Gloria und im Credo, aber auch ich in den kürzeren Sätzen, in denen eine größere Ausarbeitung gebräuchlich war. Das erste Kyrie beispielsweise beginnt mit Imitation in allen Stimmen, doch sehr schnell werden daraus alternierende harmonisch bestimmte Phrasen, die ihre Wirkung durch Umschichtung der Stimmen erzielen. Der Einfallschreichtum dieser verschiedenen Konstellationen des Hauptchores, die sich zusammenfinden, dann wieder neu gruppieren, und die elastische Art, wie der Text vertont ist, machen den unbändigen Charakter dieser Musik aus. Im Gegensatz dazu wurde die Motette Sicut lilium 1569 in Palestrinas Erstem Motettenbuch veröffentlicht. Die auf ihr fußende Messe erschien erst 1590 im Fünften Buch—etwa auf der Hälfte der Messenausgaben—, doch es gibt gute Gründe anzunehmen, daß es sich um ein relativ frühes Werk handelt. Der musikalische Stil ist auffallend klar, und obwohl sie nicht so in die Länge gezogen ist wie seine ersten Partituren, etwa Benedicta es caelorum, wo noch deutlich ein Lernprozeß zu spüren ist, wird das musikalische Grundmaterial doch erschöpfend berhandelt. In der Motette werden dem Eröffnungsthema zwei komplette Expositionen in gemächlichem Stil beigegeben, und die verbleibende Musik ist kaum weniger kunstvoll durchgearbeitet. Ähnlich im ersten Kyrie der Messe: Dort stellt Palestrina das Thema zweimal auf und verkürzt gleichzeitig geschickt die Einsätze; und alle anderen Sätze, mit Ausnahme des Gloria, beginnen mit Imitation, sogar das Credo. Stilistisch gesehen blickt das Gloria am weitesten voraus, mit einer Folge von homophonen Ausführungen bei „Laudamus te. Benedicimus te“, deren musikalische Ableitung von der Motette aber unüberhörbar beibehalten wird. Das Fünfte Buch mit Palestrinas Messen war dem bayrischen Herzog Wilhelm V. gewidmet, dessen Kantor Orlando di Lasso war. Es ist anzunehmen, daß Lasso an Aufführungen der in dem Buch enthaltenen Werke teilnahm, doch in seinen kirchlichen Kompositionen findet sich wenig von der elegischen Stimmung des Sicut lilium, und im allgemeinen scheint er von Palestrina wenig von Bedeutung gelernt zu haben. Palestrinas Motette Sicut lilium ist nicht die Vertonung, die 1583/84 als Teil seines Zyklus von 29 Motetten auf Texte des Buches der Lieder erschien. Tra le 22 intonazioni palestriniane a 6 voci della messa, l’Assumpta est Maria e la Papae Marcelli sono state a lungo le più rinomate. In entrambi i casi il vigore della scrittura può essere in larga misura ascritto alla brillantezza di taluni impasti sonori: l’una e l’altra hanno 2 parti di tenore e l’Assumpta est Maria ha divisi anche i cantus (soprani). Nessun autore rinascimentale, e pochi in epoca più tarda, sono stati tanto abili come Palestrina nel creare una musica in tonalità maggiore così precisa, dalle movenze così ‘estroverse’ e di presa immediata, e in tal senso l’Assumpta est Maria costituisce uno dei lavori più importanti del periodo. Per contro, la Sicut lilium presenta caratteristiche affatto diverse: ha un accento più pacato, più intimo, e di quando in quando sensuoso, come si addice alle parole del mottetto. Quantunque sotto questo aspetto il musicista sia molto meno conosciuto, egli ha scritto un gran numero di composizioni dalle peculiarità riconducibili agli attributi propri della Sicut lilium, delle quali la Missa Nigra sum è la più accessibile; ma anche molti suoi madrigali forniscono eccellenti esempi dello stesso tipo di invenzione. In questa registrazione sono stati intenzionalmente accoppiati due lavori, concepiti dall’autore in tali differenti stili. E’ interessante seguire il processo storico, attraverso il quale una creazione come l’Assumpta est Maria è potuta diventare tanto più celebre di ogni altro lavoro coevo ad essa comparabile. Non è che si tratti essenzialmente di un prodotto musicale migliore di altri, che pure hanno titoli per aspirare ad ugual fama. Questa messa non riesce, ad esempio, a dare dei punti alla bella Benedicta es, sempre di Palestrina, ma è meglio conosciuta, perché appena qualche anno dopo essere stata scritta attirò l’attenzione di uno stampatore, il quale, pubblicandola in edizione economica, ne determinò e ne consolidò una richiesta che la qualità della musica fu in grado di sostenere. La Missa Sicut lilium, per converso, si dà il caso che non sia mai stata pubblicata se non nelle due edizioni complete delle opere palestriniane e quindi, come la maggior parte della produzione dell’artista, è disponibile a stampa, ma è probabile che non sia mai stata eseguita. Del resto, la notorietà di una composizione del periodo pre-barocco è dovuta in larga misura a fattori storici accidentali e la sua solidità può essere rivista in qualsiasi momento; ma tali elementi di natura extramusicale hanno contribuito a rivelare i pregi di lavori che magari sarebbero rimasti nascosti, laddove, come nel caso della Papae Marcelli, non ci fosse stato un evento fortuito a dar loro una mano. Dalla metà dell’Ottocento in poi si sono avute 14 edizioni diverse di questa messa e 8 dell’Assumpta est Maria, di cui la prima è stata quella di Carl Proske nel 1835. La prima opera di Palestrina a conoscere il successo in epoca moderna è stato lo Stabat mater a 8 v., che appare a Parigi nel 1810: sinora ne sono state curate 13 edizioni, compresa una da Richard Wagner. Preme sottolineare, poi, che The Tallis Scholars hanno preferito affidarsi ad edizioni appositamente preparate per loro delle messe Sicut lilium, Nigra sum, Benedicta es e Nasce la gioja mia. In genere, per le esecuzioni pubbliche la predilezione è andata alle opere più tarde del musicista prenestino, delle quali fa parte la Missa Assumpta est Maria. La maggior precisione di pensiero, che caratterizza la scrittura dell’artista dopo il Concilio di Trento, ha trovato favore in tutto il mondo cristiano; infatti, in anni recenti composizioni come questa sono state eseguite con regolarità in culti protestanti, dove il tipo di intonazione sillabica che appare, ad esempio, al principio del Gloria è in linea con uno dei principii basilari di tutte le chiese riformate. Invece, talune intonazioni di periodi antecedenti dallo stile più rilassato ed astratto, come quello della Missa Sicut lilium, non sono state cantate frequentemente nei servizi religiosi dalla prima metà del Cinquecento in poi; hanno avuto, però, un consenso sempre crescente tra i frequentatori di concerti che pagano per sentire della musica in quanto tale, piuttosto che come un accessorio del culto. E’ un aspetto tipico del sistema produttivo musicale moderno il fatto che dei complessi corali professionisti possano non adottare necessariamente il medesimo repertorio dei cori da chiesa, anche se elaborano i loro programmi da concerto attingendo agli stessi compositori. Dato che né il mottetto Assumpta est Maria né la messa pari titolo furono pubblicati durante la vita dell’autore, è lecito ritenerli opere tarde, dal momento che tutte le intonazioni destinate probabilmente alla vendita sono apparse a stampa prima che il maestro diventasse vecchio. Anche lo stile musicale di entrambi i lavori suffraga questa ipotesi: l’imitazione rigida tra le 6 v. è notevolmente ridotta ed è, invece assai sviluppata la scrittura per blocchi accordali. Nel mottetto è evidente sin dall’inizio la semiindipendenza delle parti e alle parole ‘benedicunt Dominum’ il contrappunto viene brevemente sospeso. Queste particolarità transitano inevitabilmente nella messa, che è una ‘messa-parodia’ (composta, cioè, con materiale polifonico preesistente; in questo caso, del mottetto omonimo) e più manifestamente nel Gloria e nel Credo, ma anche nei movimenti più corti, dove era pratica abituale accogliere una maggiore elaborazione. Il Kyrie I, ad esempio, principia con un’imitazione tra tutte le voci, ma rapidamente si assesta in frasi di stile accordale alternantisi al contrappunto, la cui efficacia poggia sul fatto di essere riscritte per gruppi vocali diversi. E’ la capacità d’invenzione riscontrabile in queste suddivisioni interne della formazione corale principale, che si presenta con aggregazioni in costante rinnovo, e l’elasticità del tessuto connettivo in cui viene ad inserirsi il testo che conferiscono a questa musica la vitalità che la contraddistingue. Il mottetto Sicut lilium viene stampato nel primo libro di mottetti (1569); la messa che si basa su di esso non appare prima del quinto libro di messe (1590) (questa data si pone all’incirca a metà strada dell’intiero arco editoriale), ma ci sono tutti i motivi per ritenerla un’opera piuttosto giovanile. Lo stile vi è notevolmente terso e, quantunque essa non tenda a prolungarsi come alcune delle primissime intonazioni—tipo la Benedicta es caelorum in cui naturalmente Pierluigi mostra di essere ancora nella fase di apprendistato—il trattamento del materiale musicale di base è, in un certo qual modo, esaustivo. Nel mottetto il brano d’apertura è esibito in due esposizioni complete e in uno stile tranquillo, e il resto della musica è presentato in una maniera appena molto elaborata. Analogamente, nel Kyrie I della messa Palestrina riprende il motivo due volte, pur accorciando il tempo di entrata, e tutti gli altri movimenti, salvo il Gloria, cominciano con un’imitazione di tipo particolare. Il Gloria è il brano stilisticamente più avanzato: il ‘Laudamus te. Benedicimus te’ viene enunciato con una serie di interventi omofonici, ancorché derivati in modo inconfondibile dalla musica del mottetto. Il quinto libro di messe sopracitato è dedicato al duca Guglielmo V di Baviera, che aveva presso di sé come cantore Orlando di Lasso. Presumibilmente il musicista fiammingo prese parte all’esecuzione dei lavori contenuti nella pubblicazione, anche se le sue composizioni sacre riflettono poco della vena elegiaca di Sicut lilium e in generale non sembra essere stato gran che influenzato dall’artista italiano. Il Sicut lilium non è lo stesso lavoro che appare nel ciclo di 29 mottetti su testi del Cantico dei Cantici (1583–1584).